From the announcement of these workshops: "Since the writing of Plato, the dominant Western model of knowledge has rested on the assumption that we think with our minds and not our bodies, and that rational consciousness is an entirely separate activity from the processes that underpin our lives as bodily creatures. Recent work in philosophy and psychology, however, has re-examined this mind-body dualism and now approaches consciousness, and therefore thinking, as an embodied activity. "Though this idea is only now being developed by scientists, in fact poets and novelists have for centuries sought to represent and explore human consciousness in ways that are fascinatingly close to what psychologists are now establishing as the working methods of the mind. Our understanding of human consciousness is progressing through a genuinely interdisciplinary exploration which brings together the arts and the sciences. Three one-day workshops will explore these themes across literary studies, philosophy and psychology and from the medieval to the contemporary period. "We are pleased to announce the third Thinking with Feeling workshop, entitled 'Emotion: Expression, Narrative, Performance' supported by the Institute of Advanced Studies and the Faculty of Arts, Durham University. 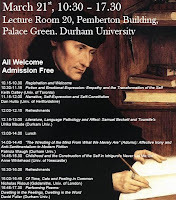 This one-day conference/workshop is on Saturday March 21st in the Pemberton Lecture Theatre, Palace Green, Durham. Admission is free and open to all. Please register with p.n.waugh@dur.ac.uk if you would like a place at this event." 10.30 a.m. Keith Oatley, University of Toronto, 'Fiction and Emotional Expression: Empathy and the Transformation of the Self'. 11.15 a.m. Dan Hutto, University of Hertfordshire, 'Narrative, Self-Expression and Self-Constitution'. 12.15 Ulrika Maude, Durham University, ' Literature, Language Pathology and Affect: Samuel Beckett and Tourette's'. 2 p.m. Patricia Waugh, Durham University,' "The wresting of the mind from what we merely are" (Adorno): affective irony and anti-sentimentalism in modern fiction'. 2.45 p.m. Anne Whitehead, University of Newcastle,' Childhood and the Construction of the Self in Ishiguro's Never Let Me Go '. 4. p.m. Nicholas Ridout, Goldsmith's College, University of London,' Of Time, Cats and Feeling in Common'. 4. 45 p.m. David Fuller, University of Durham, 'Performing Poems: Dwelling in the Feelings, Dwelling in the Words.